Mercury just moved into Taurus and will stay there until May 29th. 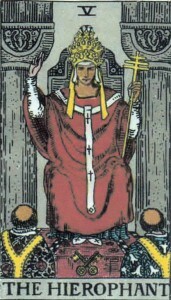 Translated into Tarot, this transit would be like the Magician is wearing the Hierophant’s clothing. He’s replaced his light robes for heavy holy vestments. Mercury in Taurus, or the Magician wearing the Hierophant’s clothing is a time when communication might take a turn towards the spiritual, and the rules of morality. Tradition, faith, and religious world views are all open for discussion and some conflict might be expected between new ideas and old. This is a period when it’s not good enough to just say one thing, then jump on over to the next. You might be asked to stop and focus. Say for real what you believe. And don’t fall for, or become, a trickster guru. Take this opportunity to review what you have faith in. Look at it from all sides and be willing to play with the ideas. New life can be pumped into stale old structures, and solid traditions can offer grounding to inspiration. You are currently reading Mercury in Taurus – Magician in the Hierophant’s Clothing at The Tarot Room.